Mary Rodwell RN ACERN (Western Australia) is a former nurse, midwife,now a professional counsellor, hypnotherapist, ufologist researcher and metaphysician. Founder and Principal of ACERN (Australian Close Encounter Resource Network.) ACERN supports individuals and their families with "encounter" experiences. It provides information to raise public awareness, both in the media, psychological, therapeutic/medical and complementary healing professions. ACERN featured in the "Australian Doctor FOCUS" Journal, (November 2003,) "Alien Invasion, why we need to believe." ACERN hosted the first international conference on this phenomenon "Hidden Truths.' Author and international speaker, Mary has appeared in several television documentaries, nationally and internationally. Mary directed and presented the EBE award winning documentaries, Expressions of ET Contact..a visual Blueprint?" & Expressions of ET Contact a communication and Healing Blueprint? Author of ‘Awakening - How Extraterrestrial Contact Can Transform Your Life.’Vice president of the Star Kids Project and official representative of the Star Kids Project Ltd. Australia. Clinical Member of ACCET (Academy of Clinical Close Encounter Therapists) USA. Mary's research embraces the physical, psychological, scientific and metaphysical implications of Contact. ACERN participated in a thesis by Simon Harvey Wilson ( MUFON Rep) for Edith Cowen University of Western Australia. Comparisons between shamanism and Abduction, which demonstrated similarities between Contact experience and a modern ‘shamanic journey.’ Mary's research focus's on the transformative changes after Contact such as heightened psi abilities, telepathy, clairvoyance and healing. She explores the implications of the unusual and complex artwork, scripts, symbols and strange languages, with "down-loading" of complex data conveyed through mental images and concepts, "energy signatures" or"wave forms" at this heightened consciousness level. The "new human' ie children with a history of Contact. "Star Children." who can exhibit a maturity and wisdom beyond their years, past life memories and dual consciousness sharing, and conscious awareness of the spirit and angelic realms. ACERN explores such connections to the so called 'indigo's, the rise in multidimensional awareness, and the medical /scientific and metaphysical evidence to support this hypotheses. 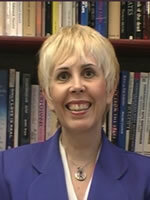 Mary Rodwell is a member of the Advisory Board of the Exopolitics Institute.